Since we patented a steel strap ferrule to connect a wooden handle to tools like rakes, shovels, and hay forks back in 1925, the lawn and garden industry has been important to our portfolio of products. 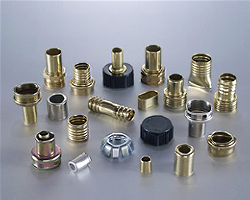 Today, Winzeler Stamping Company is recognized as a leader in the design, manufacture, and supply of brass garden hose couplings and hose ferrules. Having developed a complete product line of stamped and composite stamped / machined couplings for plastic and rubber hose applications, we serve original equipment manufacturers as well as hose & accessory distributors world-wide. Our hose couplings and hose ferrules are stocked in industry standard sizes and available for immediate shipment to your location. All of our stamped and composite stamped/machined brass and Eco-Brass lawn and garden hose couplings have been thoroughly tested and analyzed by an independent laboratory and are compliant with the current lead-free water legislation in California (AB1953) and Vermont (S.152). Our products also meet or exceed the guidelines associated with NSF/ANSI Standard 61 -Annex G. Throughout our 92-year history, our customers have been able to count on us to deliver high quality products, provide first-rate customer service, and assist with technical advice, product design, and innovation. Winzeler Stamping Company proudly offers Eco Brass (lead-free) options for any of the machined parts we manufacture. Eco Brass is a newly developed lead-free brass alloy (less than 0.09% lead content) that eliminates the problems of stress corrosion cracking and dezincification corrosion. It is also an excellent material choice for applications mandated by drinking water laws, or where strength equal to stainless steel is required. If you have questions about Eco-Brass, Contact Us to discuss your application. As a high volume metal stamping company that has been in business for nearly a century, we have the capability, the expertise, and the financial strength to meet the challenges of today’s global market. Let us to go to work for you!